2 What did you miss at Asia Fruit Logistica? Members of the fresh produce industry in Japan and around the world are mourning the loss of Toshikazu Shoji following his sudden death last Wednesday (7 October) at the age of 66. Shoji, who was an adviser to major Japanese fresh produce group Royal Co and former director of the company, died after falling from his bicycle into a dry canal on the evening of 6 October. In a statement, president and ceo of Royal Co, Ko Nokano, spoke of his “inexpressible grief” at the news and offered his “heartfelt condolences” to Shoji’s family. “[Shoji] spent most of his life working on the introduction and popularisation of imported fruit and vegetables from the whole world in Japan,” he said. Royal’s overseas business division manager, Akanari Iida, who reported to Shoji for 15 years, said he had learned a great deal from him. 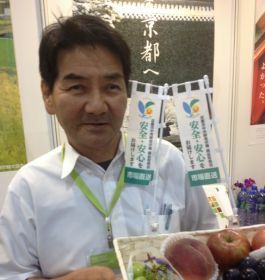 “Shoji was a great pioneer and professional of this industry and he introduced new fruits from all over the world to Japan,” he told Asiafruit. Toshikazu Shoji joined Royal’s parent company Kyoto Seika Godo on 1 April 1981. He moved to Royal on 1 June 1992, where he focused on importing and purchasing. Shoji went onto to develop relationships with many overseas suppliers across a range of sectors including citrus, bananas, strawberries and avocados among others. Having been a director of Royal, he moved into a part-time role as advisor to the company at the end of May last year, and was due to retire on 31 March 2016. Paul Smits, director and co-founder of NEH Philippines, was one of Shoji’s many supply partners and friends in the business. Shoji’s wake was held on Saturday (10 October), followed by his funeral last Sunday.